From Mysterious Reviews: Organized in the manner of a screenplay, a clever nod to both the characters and how the plot is structured, a lot of fast-paced entertainment is packed into these pages. But the real treat here is the dynamic between LAPD homicide detective Shane Scully and his new partner, Sumner "Hitch" Hitchins. 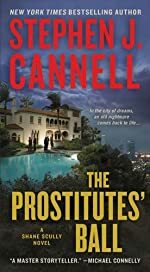 Synopsis (from the publisher): Detective Shane Scully responds to a call in the Hollywood hills at a once-immaculate mansion, the scene of an infamous murder twenty-five years prior. He discovers the remnants of a lavish pool party. The revelers have fled, leaving three dead bodies in their wake, all shot with the same gun. One is an acclaimed film producer. The other two, a pair of gorgeous women. With his new partner, Sumner “Hitch” Hitchens, Scully begins to investigate what looks to be an open-and-shut case: The women were hired prostitutes, and there's security video of an angry husband firing on all three. A simple case of brutal revenge. But nothing is ever as simple as it seems: There's a single spent bullet casing that doesn't match the rest. From that single bullet emerges a story of love, murder, suicide, and one of the biggest financial frauds in L.A. history. Someone has gone to great lengths to cover up a decades-old crime, and as Scully and Hitch get closer to the answer, they find themselves in a killer's crosshairs.